As part of the its reopening celebration, O’Charley’s Restaurant on N. Lexington Springmill Rd. in Ontario recognized local veteran Braxton Daniels, Sr. as a Hometown Hero. The recognition took place on Tuesday, June 16 at 6:30 p.m.
Daniels enlisted in the United States Marine Corps in 1953 and was discharged in 1955. During his military career he served in Korea, where one of his fondest memories was meeting Marilyn Monroe during her 1954 USO tour. As a veteran, Daniels supports and has had involvement with organizations such as the American Legion and AMVETS. 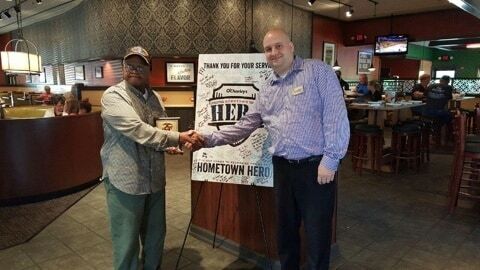 O’Charley’s is honoring Hometown Heroes at 30 remodeled restaurant locations this year in conjunction with the company’s revitalization and reimaging plan. O’Charley’s has a longstanding history of honoring veterans and active duty soldiers. More than 100 individuals have been honored during the Hometown Hero program. St. Peter’s Boy Scout Troop 121 helped celebrate Daniels with a color guard presentation and a bugle performance of Reveille. Troop 121 has been a part of the Mansfield community for over 60 years and has a long history of community involvement and honoring veterans. The organization also brought along Emily Raff to sing the National Anthem. Following the ceremony Daniels and his friends and family enjoyed a complimentary dinner at the restaurant.